Aponiente’s listing in the Michelin online guide, showing the pescatarian restaurant’s coveted three-star ranking. When the Michelin stars for Spain and Portugal in 2018 were announced earlier this week, there was some exciting news for Andalucia: the region added to its tally in the most impressive and prestigious way possible. We now have our first three-star establishment: Aponiente by Angel Leon, in El Puerto de Santa Maria (Cadiz). The ground-breaking “Chef del Mar” specialises in using high-tech, innovative techniques to create dishes from an astonishing variety of marine ingredients, including fish often overlooked by others, such as plankton sponge cake and seafood chorizo. Leon now joins the hallowed ranks of just 11 chefs in Spain and Portugal who bear the triple crown; to put this into context, the UK only has five three-starred restaurants. “Immerse yourself in the fantasy culinary world of Angel Leon, a gastronomic visionary. In addition to this highest of honours, Leon’s Alevante restaurant at the nearby Melia Sancti Petri hotel, a five-star GL beach resort in Chiclana de la Frontera, earned its first estrella Michelin. The other new Michelin star in Andalucia went to Benito Gomez’s Bardal in Ronda. This restaurant run by the Barcelonan chef resumes the Michelin tradition in the hilltop town started by two-starred Dani Garcia just over a decade ago – he earned his first star there at Tragabuches in 2000. As a result, Malaga and Cadiz the two Andalucian provinces which boast most gastronomic gongs, with nine and four respectively. Almeria (province) and Cordoba (city) have two each, while Seville and Huelva regional capitals have one each. For the 16 restaurants with Michelin stars in Andalucia, see this page. A multi-charity Christmas fair, organised by the Anglican Church in the Costa del Sol, will be held in Estepona on 25 November. Entrance is free, and visitors can enjoy live music and entertainment throughout the day, as well as Santa’s Grotto, face painting, magic shows, bouncy castle, classic cars from the Classic Car Club of Andalucia, and 30 stalls with great Christmas present ideas. The five charities that the local church is supporting will be there (Collective Calling, Caritas, Aspandem, Little Sisters of the Poor and Emaus), as well as other charities aiming to raise much needed funds for their causes. The fair, which will be at the Palacio de Congresos in Estepona, will be opened by Hannah Murray of TRE Radio. There will also be food and drink on offer. Visitors can enter a charity prize draw with big prizes (to be drawn at the fair). Sherry Week is on now: 6-12 November! This is the fourth annual Sherry Week, taking place in 26 countries. Anyone who enjoys drinking Sherry, the versatile fortified wine from the town of Jerez de la Frontera (Moorish name: Xerez, pronounced Sheresh), will be delighted to hear that this week is Sherry Week! The annual worldwide celebration of these wines, which range from bone-dry to smooth and sweet – fino, manzanilla, amontillado, oloroso, palo cortao, cream and Pedro Ximenez – has grown every year since it started in 2014. This year more than 2000 events are being held in 26 countries around the world, from now until Sunday 12 November. Sherry Week was founded by Spanish-Australian marketer Chelsea Anthon Penas – you can read our interview with this dynamic wine-loving entrepreneur here. The Week started off as World Sherry Day, and since has grown exponentially, with countries from Australia to the US, via Ecuador, Norway and Taiwan, hosting events. In Spain alone you can go to a staggering 900 events, of which the most popular type is gastronomy-related – in other words pairing Sherry with food. This will usually consist of a tasting menu of three or more tapas, each paired with a Sherry which complements its flavours. But the dishes don’t have to be typically Spanish – any type of world cuisine can be matched to a sherry. In some restaurants, a dish or tapa paired with a Sherry with be available as a special offering throughout the week. You can also go to a tasting, where an expert will guide you through a number of Sherries, called a “flight”, explaining the subtleties of each individual wine. Leading the charge here in Andalucia in terms of Sherry Week events is Seville, with nearly 300 tastings and pairings, followed by the Sherry Triangle – the towns of Jerez, El Puerto de Santa Maria and Sanlucar de Barrameda – the only area where Sherry can be made – also hosting around 300 events. 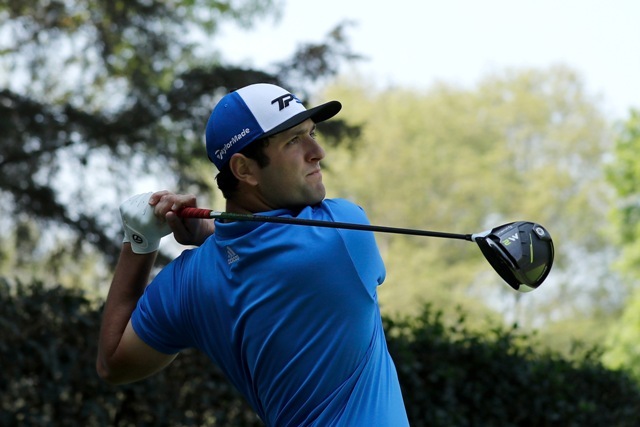 Rising Spanish golf star Jon Rahm will make his first professional appearance in Spain at Valderrama, during the third edition of the Andalucía Masters on 19-22 October. The event is hosted by the Sergio García Foundation and sponsored by the Junta de Andalucia. Rahm currently ranks 5th in the OWGR and the FedEx Cup, and 3rd in the Race to Dubai in his impressive rookie season. He won the Farmers Insurance Open, his maiden PGA Tour title, in January. In July he earned his first European Tour victory by winning the Dubai Duty Free Irish Open by six strokes. The Spanish rising talent (born in Barrika, Vizcaya, on 10 November 1994) is relishing his home debut. “I really look forward to playing in front of the Spanish fans. Right after the Irish Open I went to Valderrama to practice for October. I felt a big sense of anticipation as I teed up on the first hole. I wish to encourage everyone to come and support us and watch some great golf. If the public enjoys it, we will enjoy it. “My first round at Valderrama was five years ago when I played the Sotogrande Cup with the Spanish national team. It was a different experience because my game has changed a lot since then. I remember playing in a gale. The family became so addicted to golf that they took a week’s vacation every year to go to Valderrama for the Volvo Masters. Jon has vivid childhood memories of those tournaments where the trophies he collected on the course were the autographs of his idols. “I remember my first visit with my father during the 2007 Volvo Masters. The first player we saw was Thomas Björn on the 7th. Then we went to the first to watch Poulter and Sergio tee off. We followed Poulter who played a great shot on the first. I went ahead of my dad and was lucky enough to see Justin Rose ace the 3rd, but my dad didn’t see it. We followed Poulter along the 4th and we waited for Colin Montgomerie on the 5th. The next thing I remember is the 17th, a great hole. You need a perfect drive to a tight fairway and then you are facing a daunting second – it reminds me slightly of the 15th at Augusta. Ten years after collecting those autographs, Jon returns to Valderrama as one of the world’s top players. “In October I will be proud to play my first professional event in Spain. I look forward to playing the Andalucía Valderrama Masters in front of my home crowd and will do my best to give a good show. My name is Andrés and I have just returned to Málaga after living abroad for nine years. I grew up in a bilingual home in a small town 80 km away from Málaga. When I turned 18 I moved to the capital to study journalism at Málaga University. During my student years I had the chance of living in Portugal and Colombia thanks to the mobility programmes offered by the university. Since then I have been combining studies and work in different countries around the world including Scotland, Holland, Chile and the U.S. among others. In all these places I’ve met fascinating people, I’ve discovered incredible places and learned about different customs that changed the way I understood life. Despite all this I have always felt really Spanish at heart. However now that I’m back in Andalucía, there are certain things I don’t completely relate to anymore. Here are my five biggest culture shocks after returning “home”. Growing up in Andalucía I was a loud boy, a loud teenager and, looking back, weirdly proud of my high volume setting. For me, and I think for most Spanish people, being loud correlates with having a good time. I guess this opinion has changed while I’ve been living abroad. In Portugal I laughed at a sign on the bus that said: “Silence please, this is not Spain, and I’ve often felt self-conscious in Scotland or Amsterdam when Spanish friends couldn’t control the volume of their voices. Now that I’m back in Spain, my Spanish friends who ask me why I speak so quietly. Greeting people is undoubtedly the most confusing of social practices to learn while living in a different country. Each nation has its own system: shaking hands, a hug, one kiss, two kisses, three… Scotland was the first English-speaking country where I lived, which meant I found its etiquette the hardest to understand. It was tricky to know whether I should shake hands, hug or just say hello. I felt constantly confused, particularly after coming from a place where the norm is two kisses for men and women, and shaking hands between men. But now, years later, I’m incredibly confused to realize that I can’t approach a Spanish person in the usual local way. “Sorry, I´ve lived in northern Europe for too long”. For the last four years I’ve been based in Amsterdam. It’s my favourite city: the perfect size, with a great cultural offering, beautiful architecture and lovely people. The only real problem living there was the horrible, never-ending cold. I would actually feel afraid leaving the house in winter. The Amsterdam chill felt like a bunch of angry kickboxers slapping your face. Now that I’m back in Málaga, all I can complain about is the fierce heat that increases every year, and how overrated coats are! If you ask any Spaniard living abroad what they miss most about their home country, 95% will say the food. Spain is incredibly proud of its gastronomy and probably the most difficult change when you live abroad is adapting to new food. That’s why I found it so strange when some North Americans asked me if we only eat Spanish food in Spain. I had never really thought about it; the UK has a big tradition in Indian food, it’s easier to find a Indonesian restaurant in Holland than an actual Dutch one, but Spain’s long gastronomic tradition – plus the isolation during the dictatorship years – means most menus still feature traditional dishes my abuela would have cooked. In the months before I came back to Málaga, I was really excited about returning to start a new life in my home city. Once I got here, all it took was one visit to an administrative office to swear I was leaving Spain and never coming back. Eventually I calmed down after remembering how painful bureaucratic visits had been anywhere I had lived. Maybe being in a foreign country, or not speaking the language, made me less demanding and more patient. After all this I still can’t decide If I would rather complain about the cold or the heat, or if on a Tuesday night I should go for tapas or look for an Ethiopian restaurant. Anyone else have the same problem? Outdoor events rule the scene in summertime Seville, as temperatures climb to the 40s on a regular basis (105F). Here are some of the cultural events on during July and August, from music, theatre and dance to outdoor cinema. One of the most long-standing events is the Noches en Los Jardines del Real Alcazar, now in its 18th season. These concerts in the gardens of the royal palace, next to the Charles III Pavilion, take place from Monday to Saturday until 9 September, and include flamenco, classical and world music. Especially recommended are dates featuring superb Seville Royal Symphony Orchestra oboeist, Brit Sarah Roper, who plays on 3 August in a duo with guitarist Maria Esther Guzman, and on 5 September in the MeSaMoR Trio, featuring Maria and flautist Vicent Morello. For the full programme, and to book tickets (avoid the online booking fee by collecting tickets in person, see alcazarsevilla.org Concerts take place at 10.30pm, with the gardens open an hour earlier. This season of concerts and plays continues until the end of August.. In an equally historic, though less celebrated setting, the 12th-century Palacio de la Buhaira in Nervion, you can see concerts almost every night until 17 August and then plays until 31 August, in Noches en el Palacio de la Buhaira. Music includes opera recitals and soundtracks. Performances start at 10pm. For more, see this page. In the Macarena district of the old town, behind Feria market, Palacio de los Marqueses de Algaba has a season of theatre which lasts until 24 September. Find out more here. The Tobacco Factory sees a varied season of events. Another historic building, the Fabrica de Tabacos, hosts a season of cultural events, including flamenco, movies, poetry and theatre. See the full programme here. The exhibition is on until 15 October. For all garden lovers, this art exhibition – Sorolla: Un Jardin Para Pintar - is a treat. The show of paintings by the Valencian artist, which has just opened at CaixaForum, a major new cultural centre in Seville. runs until 15 October. Joaquin Sorolla was an internationally-renowned post-impressionist painter who worked in the late 19th and early 20th century, with many exhibitions in Paris, London and the US. Sorolla loved gardens, and often visited the Alhambra and Alcazar of Seville; his paintings are known for their exquisite use of colour and light. A tiled bench with pool in Sorolla’s garden in Madrid. In 1911, the artist decided to design his own house and garden in Madrid. He wanted to bring together his studio, living quarters, family and a beautiful outside space. In the heart of Madrid, on Paseo de General Martinez Campos, he built a house with a wonderful garden consisting of several Andalucian patios, inspired by his favourite spots in Granada and Seville, complete with fruit trees, Moorish-style pools and fountains, and tiled benches. Plants were chosen carefully for their colours – rose, oleander, azalea, hydrangea and lilac – with many shades of white, pink and blue. Many of the plants, trees, tiles and statues were brought from Andalucia. You can visit his house and garden, now the Museo Sorolla, an oasis of tranquillity in the vibrant Spanish capital – which is exactly as the painter envisaged it, for himself and those closest to him. The Patio Andaluz in Sorolla’s house in Madrid, by Sorolla. Painting his garden became a source of great pleasure to Sorolla, and this exhibition in Seville portrays his love for this very personal sanctuary, right up until 1920 when illness prevented him from continuing to paint. The exhibition consists of more than 170 paintings, drawings, sketches and photographs, mostly from the Museo Sorolla in Madrid. It’s fascinating to see how his vision for the garden developed through from rough scribbled notes, to careful detailed plans. Handwritten note from Clotilde and Maria, Sorolla’s wife and daughter, to the painter, with pressed flowers. Other delightfully personal exhibits include hand-written notes with pressed flowers from the painter’s wife and daughter to him – a deeply thoughtful and touching gesture in these days of instant messaging across the globe. Although many of the paintings of Sorolla’s own garden are similar – or at least variations on a theme – it is fascinating to see how he drew from the famous Moorish gardens of Andalucia’s greatest monuments, continuing the Moorish style. If you go as a family, don’t miss the excellent hands-on children’s activities within the gallery, themed around the exhibition. CaixaForum is open daily from 10am-8pm. It is located next to the Torre Sevilla, on Camino de los Descubrimientos, with the entrance on Calle Jeronimo de Aguilar. There’s an underground car park; street parking is difficult on weekdays during the day, but easy in the evenings and at weekends. Family visits to the exhibition are available at weekends, while guided tours take place daily on Monday and Thursday to Sunday. In September there are poetry readings and concerts. This month music fans in Torrox Pueblo and Estepona have a treat in store. She and her parents were based in Frigiliana for five years, when Mozart was between the ages of 5 and 10, travelling during the summer months, and living and going to school in the Axarquia village in the winter. Since 2006, Mozart has been home-schooled, or as she says, “world-schooled”, travelling from country to country with her parents, visiting 48 in total. Currently based in Los Angeles, Mozart is trilingual, speaking English, Spanish and Mandarin Chinese, and has worked professionally in all three languages. She lists her musical influences as Ed Sheeran, Simon and Garfunkel, the Beatles, Jesus Corbacho Enrique Iglesias and currently Halsey and Rixton. Playing the violin since two years old, and piano since three, Mozart started writing songs at the age of four. No slouch on the literary front, she loved Shakespeare as a toddler. Her early creative development was no doubt helped by the fact that her parents are both artistic-performer types – mum is an actress/writer, and dad a visual artist/creative director. In addition, Mozart champions environmental and social issues, and is an actress. With a very high IQ, she has already finished her first year of college. Mozart will be travelling with her parents first of all in the UK, where performed at the Baltic in Newcastle (8 June) and gave a keynote speech at Tech on the Tyne conference (9 June) about being a world-schooled digital nomad tech-teen. In total, her trip will cover nearly 3,000km, merely a dainty footstep compared to her global wanderings.